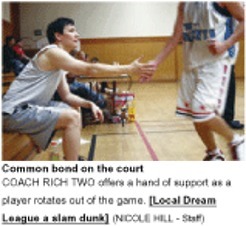 Rich Twu’s team has just lost another basketball game, but he’s in too much of a hurry to give it much thought. He’s got another game to play in a short while across the Bay in Oakland. In fact, by the end of this hectic Sunday, the San Francisco resident will have played in three full contests, including one in San Mateo. Twu is one of more than 500 players on 58 teams who play weekly in the Dream League, an amateur basketball circuit made up of Asian-American men in their 20s and 30s from all over the Bay Area. The league is growing like gangbusters, with a new branch recently opened in New York City, and it provides a valuable connection for a population that was by all accounts crazy for the game even before the emergence of Chinese NBA star Yao Ming. Twu is not just a fanatic, by the way. He’s also the league’s commissioner and founder. Many Asian Americans are melded into the social life of the Bay Area, so they do not necessarily have a lot of interaction with other Asian Americans beyond immediate family or friends. But the Dream League is one way Asian Americans do interact. And Twu is also trying to broaden the league to do work to help underprivileged youth. Ricky Hui, 39, captain of a team made up of Asian Americans who work for the San Francisco Fire Department, likes the way the league brings Asian Americans together. racial requirements for entry that officials routinely demanded birth certificates of some players. Thus began the Dream League, where the uniforms are colorful, standings and individual statistics are kept updated on the Web, and team names are as wide ranging and vivid as Dynamic Flying Broth-ers, Shotcallers, Bisaya Tagalog United, and DrunkenMasters. Despite the league’s Asian-American population, the games are not too different from other open leagues, says Taraz Lee, 22, of San Francisco, after winning a recent game at Ira Jinkins Recreation Center in Oakland. “I just think it’s a lot more serious because I want to give a good name to myself,” said Lee, who is Persian and African American. Twu occasionally has to handle disputes over eligibility. Last year, a team captain questioned whether a player from another team had any Asian blood. The captain said the player, a tall power forward, looked African American. Twu asked the player for a birth certificate, but he did not have one and gave Twu a small wallet-sized family photo of himself with his Filipino relatives. Twu accepted the photo. “I never wanted to be so strict about it,” says Twu. The ethnic-specific leagues were vestiges of a time prior to the Civil Rights era in the 1950s, when many recreational associations, like most institutions in American culture, were racially segregated. Whites played with whites, Asians with Asians, blacks with blacks. Twu says despite Yao Ming, the 7-foot, 6-inch Houston Rockets center from China, there just are not as many tall Asian-American players as in other racial groups. He also notes some of that is just perception — like the familiar stereotype that white men can’t jump. In the end, winning in basketball often depends on who is tallest. Still, Twu says the best teams from his top Asian division can hold their own against the talented and taller teams in his “Open League,” which allows any races. The Dream League keeps individual player stats for each game and posts them online. They also post articles about selected games. Twu, a UC Berkeley graduate, worked as a management consultant before opening his own angel investment fund during the dot-com boom. Twu wants to use those business skills to benefit under-privileged youth. He has hired five high school students through San Francisco Mayor Gavin Newsom’s youth program. The students do everything from score keeping to data entry. “All of those skills can be translated into the step-by-step skills as an entry level person at Oracle or other companies,” he says. Twu wants to expand this community connection into an after-school program for students. He said he believes students not interested in school can learn and gain skills working with the league. Meanwhile, in Twu’s game in Oakland, his team stays close with the Heads, a mostly Filipino team wearing sharp NBA-style yellow uniforms with black pinstripes. They dart across the floor, quickly moving the ball around. While there are not as many tall players in this Asian league, the pace is much faster — and sometimes more athletic — than other open leagues. A young player on the Heads dribbles the ball up the court, then without looking tosses the ball up toward the rim. His teammate glides up into the air and easily tips the ball into the basket. Twu, on the other end of the court, watches the play in admiration. He smiles and runs back up the court. His team would lose the game, but for Twu and many others in the league, just playing the game is enough. For more information visit http://www.dreamleague.org.